With our Basic Edition, we offer a solution for small and medium sized companies or freelancers who want to achieve convincing results with little effort. FlipBooks created with this version are particularly attractive because of ease of use. With the modular design, you can put together a professional presentation to suit any of your desires and needs. FlipBooks offer a highly realistic 3D-flipping effect. You can flip the page by clicking the mouse on the side corners, the page thickness, the navigation buttons or the keyboard with the arrow keys. 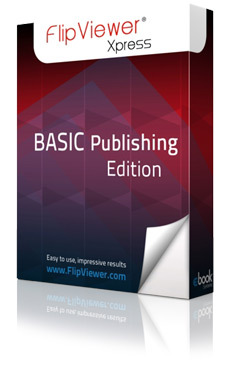 FlipViewer Xpress will present to your readers optimized content in high quality after a brief loading period. The menu bars are easily structured and there are tooltips to explain each function. During the creation process, text and images are processed separately. The text is fully embedded in the FlipBook. Thus in every zoom level text remains extremely sharp and very readable. According to the individual reading needs of the reader, different display modes for the FlipBooks are available. Links to websites, e-mail addresses or internal pages created in the PDF are automatically applied. You can create a table of contents in FlipBook that can be accessed via the side menu bar. Up to 5 hierarchy levels are supported. PDF bookmarks are automatically applied to the contents, but you can also add your own Table of Contents during the creation process. If you want to purchase an item in your catalog or want to jump from your website to a specific article in your magazine, you can jump to the individual pages of FlipBooks directly. FlipViewer Xpress is international and the language can be specified during the creation process. Reader can choose from 21 languages ​​for the user interface. Customize the background of each FlipBook, with a background color or a background image. An offline version (on the PC, Mac and Linux) in a single file allows easy sharing. Ideal for exhibitions, client presentations or catalog CDs. Reader can download either single pages, the complete PDF or range of pages. The user can be restricted if required. You define e.g. whether to allow print, highlight, copy text, etc. Colored bookmarks on the pages provide fast access to respective chapters/pages of the FlipBook. This can also be added by the reader. The archive function allows past issues of the magazines or catalogs to be displayed. Videos, image galleries or other content can be displayed attractively in a pop-box dialog on top of the pages (Lightbox). The integration of a Google Analytics code will allow you to understand the traffic to your FlipBook. Users can, with a few simple steps, share the FlipBook on social media. thus widening the distribution.